﻿ Caesars Palace Las Vegas, Las Vegas (NV) | FROM $86 - SAVE ON AGODA! Have a question for Caesars Palace Las Vegas? "It definitely had the best buffet by miles." "Near attractions and the strip." "Superb location with great views and staff were very polite..."
One of the most well-known and prestigious resorts on The Strip, this luxury property with well over 3000 rooms is spread across five towers. The 129,000sqf Gaming Zone includes slot machines, table games, a Poker room, as well as a Keno Lounge. It is also the current home of the National Heads-Up Poker Championship. If you wish to explore the many attractions in the city, the Leisure Concierge can help make reservations for shows, nightclubs, and tours. The hotel also features a number of award-winning dining venues, including Bobby Flay’s Mesa Grill. The hot-spots of Vegas are just steps from your room. Browse some of the world’s finest retailers at the nearby Forum Shops or enjoy the popular Pure nightclub, the Pussycats Lounge, and the floating Cleopatra's Barge - all available at the hotel. After a weekend of dancing and high stakes gambling, why not head to the Qua Baths & Spa for a relaxing treatment session before you head back home. 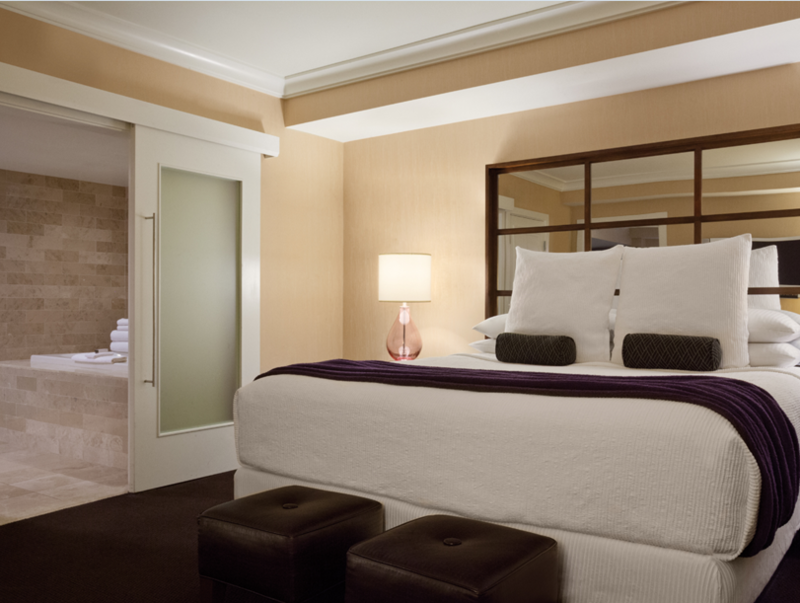 Caesars Palace Las Vegas offers unlimited luxury and impeccable service from the moment you step in. 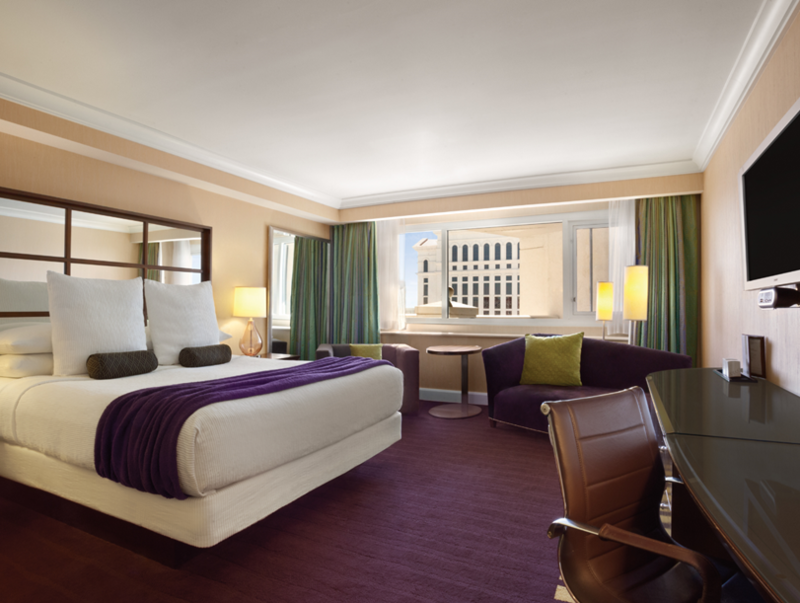 "The stay at Caesers Palace was a wonderful experience." The minimum age required to check in at this property is 21 years. A limited selection of drinks and pastries is available for rooms that have the breakfast inclusion. Anything additional will need to be purchased by guest. A limited selection of drinks and pastries are available for rooms with breakfast. Gala dinner/breakfast is provided for 2 persons per booking. Any addition person will be charged an extra fee. The room rate with breakfast includes USD 10.00 credit for 2 persons per day only. Kindly contact the property directly for further details on breakfast. I loved the Hotel experience but not the Hotel. Very Vegas - all for show and not very genuine. It started with check in when we were asked to pay a charge of US $30 as check in had not commenced. I believe we were checking in it at about 2pm in the afternoon and like most tourists had been up for almost 24 hours. so of course we paid. We received our wifi code. My daughter was concerned it was not free and so I called reception from the room to be told it was included in our resort fee! No mention of an additional fee for this. Naively I assumed it was built into our room fee. No mention of the fee to me at the time.Upon check out we received a bill for the extra $44 per day for the wifi use! Over the top and a money making scam. Would never stay here again and will not recommend to friends. A sharing plate consumed at one of the bars was disgusting. It had been pre made and left in the fridge to dry out. Staff were all rude and Vegas is one big gambling game. Check in is 4pm and check out is 11am, they should make the check in much earlier and check out later than 11am since you pay for like 200+ per room ,we asked for late check out since my husband need to have much rest needed coz he need to drive for 10hrs back to SF but the customer service said its not an option and wr should check out at 11 even though we receive a text from them that we can check out at 12pm. Beware of the thing in mini bar too. If you touch it intentionally or accidentally even it just a seconds it will cost you. We are not comfortable in that part of the room like theres some trap. And at 330am there this woman who banging our door repeatedly and when my husband open it and said she got a wrong room, she insist its the right room and she asked if she can come in , she just wondering around the hallway in 69floor, such security. Nice clean hotel, great structures tho. lovely hotel and location. perfect for couples to relax. the pool area was nice and clean and had confortable sun loungers to chill out. would definitely recommend as great value for money. would be even better if they had more hangover related souvenirs in the gift shop! The rooms are outdated. You have to pay for everything including making coffee in your room in the morning. With all the beautiful hotels in Vegas and the way this place looks like on the outside, the rooms were horrible. I could have gotten a cheaper room that was much nicer and a cup of coffee in my room for free somewhere else. Never again. Overcharging! They charge for almost everything. You can't use the fridge to chill your own stuff as they'll charge you once you take something out even if you don't drink it. All swimming pools are closed even thought the website was claiming that one heated pool is open all year around. Although all pools closed the resort fee is the same as in summer when you have the pool entrance. They even charge for parking and wifi is free only for 2 devices per room. The location and cleanliness are great, however I could not see any value in the price we paid. We stayed at Caesars when we came out to see Cher - a quick trip, just 2 nights - we were looking for a bit of "old Las Vegas", and Caesars certainly embodies that classic Vegas feel. Everything was fabulous, the accommodations were great - we stayed in Julius Tower and had a junior suite - and while it was a great size for the 2 of us, I don't know that I'd classify it as a suite, more like a decent sized standard room. At check-in, we had the option to forego daily housekeeping for a $10 credit - which we took because we were only there a couple nights - we didn't realize, however, that the credit - that was accepted at a wide variety of places in Caesars - needed to be used prior to check-out because that credit was NOT taken directly at the establishment, but passed along to the front desk and would be taken off our room bill. And while Caesars was VERY clean, there was an abundance of cigarette smoke throughout the casino, so that was unavoidable. Pros -wonderful location; near attractions and the strip. -clean and comfy rooms (stayed palace deluxe room with double bed) -lots of signage to guide me ard the hotel though it’s big and my first time being in Vegas it was quite tourist friendly. -check in/ out electronic kiosks to avoid queueing at the front desk to minimize time. Cons -Did not see any hotel staffs therefore no contact at all can’t comment about the service however did see see some cleaning staffs. - Valet for main hotel was full upon arrival so parked at back of hotel ( collosium side ) valet there was almost non existence no staff at duty or little staff to assist in valet for car and parking charge for hotel Guest per day was 30USD pretty steep considered we were staying guests. Overall quite a nice hotels with wonderful location and room just that the room I got didn’t have any view (it was view of back of the building like carpark etc.) sadly. I love it here and would do it again and again,the one thing I had an issue with was paying for coffee in my room like really?? At least you can offer that for free especially for the price we pay for the room. Optional last minute exclusive deal to upgrade my room at check in for only $11 - totally worth it! My room was in Octavius Tower, which was super far away from the self park garage (that was my only negative), but the room was huge and the bathroom had separate shower & tub (with jets!). Overall, awesome! I was stayed 2nights at Octavianus tower. Very large hotel. For check in and check out process you can use the reception machine (no need human here). The breakfast menu was excellent! Value for money. Great location, the location allowed us to access the main strip with no problems. The only con is that the pools were closed and reception for check-in was a misson to get to. You basically have to walk the entire casinon from the car park. During my Vegas Trip, Ceasers hotel is the one of best choice i made. Hotel was nice and buffet was wonderful (price is high but good quailty) Staff was very friendly and hotel facilities and pool is super nice. Location, facilities and friendly staff. We enjoyed our stay here. However, our room was not cleaned and our towels were not changed. We had to phone the front desk to complain. Our room was cleaned at 7-30pm that night. Parking is "Valet Parking" and is free. This is very convenient. There are no extras included in the room price. There was a coffee machine in the room, but, the price to use it was $13.00 for a coffee. The hotel had typical "extra" charges that are in small print when booking the room. Namely resort taxes you had to pay the hotel. Comfortable, very large rooms with very large washroom and shower room. Expensive but with best location on the Strip. Beware of getting lost inside the hotel and its shopping center. Super large hotel. We had been to Vegas before and really wanted to stay at Caesars.. the walls were paper thin and could the couple fighting in the room next door, the beds were so uncomfortable , the entrance to our lift smelt like rotten fish , we ordered room service and a sandwich was $46 and water was $12 !!! But the worst part was we went for a shower and there was no hot water we called reception and they said they were doing maintenance and could move us but our kids were already asleep, they said it would be fixed by 4am but at 8am we still had no water!! All they done was not charged us resort fee for that one night!! Never ever again will I stay at this place.